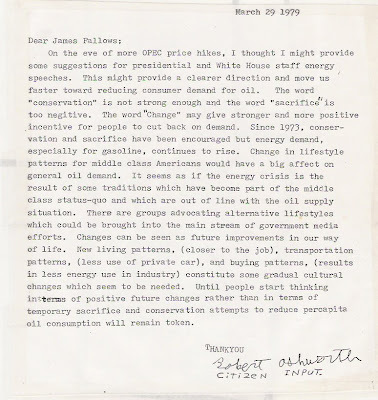 Not long out of college, in spring of 79, I was following energy speeches by then President Jimmy Carter. Thinking that the word "sacrifice" was too negative, I suggested it be replaced by the word "change." Put a more positive spin on the transition our culture needs to make. So I wrote to Carter's speech writer. Now it's the 30Th anniversary of Carter's famous malaise speech; the one that never even used that word malaise. It was the speech that pundits gave that label to after the fact. When I wrote, I suggested putting a more positive spin on the transition we need to go through to save energy. Sacrifice doesn't sound positive enough. Change was my suggestion. Today, the word transition is used. There's "transition," "transformation," "evolution," "a new world dawning." All that "new age" talk. Bicycle for you're figure and all that fun stuff. Speaking of a more optimistic future, we've really experienced a technology revolution since those days. Putting a futuristic spin on low energy living. No more going back to the cave. Ipods (which they didn't have back in 79) are lower impact than automobiles. Carter's chief speech writer wrote back a nice letter. He said my ideas were good and thought the President would agree also. This was before the famous malaise speech of July 15 79 that historians are remembering today. I'm not sure my ideas got through to the President as I think sacrifice was still the dominant theme. 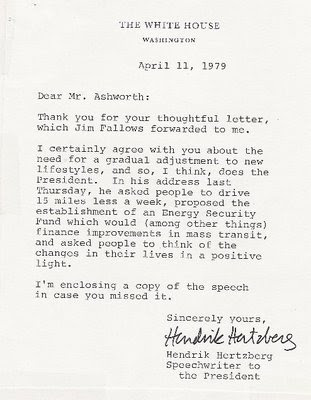 Still I got letters from both James Fallows and Hendrick Hertzberg. I wrote to Fallows thinking he was the speech writer. This was before Internet days so it was the most recent address I could find at the public library. Some reference book on the US Government, no doubt. Fallows forwarded the letter so nice reply's came back from both men. It was spring 1979 before Carter's now famous speech. Did my letter have an influence on that speech? Hard to say. Maybe not. The speech was of a type to still inspire the word "malaise" for a label.